The Bunaken - Manado Tua National Marine Park geographically located in Indo Pacific region and holds the richest marine diversity on the planet, where the Bunaken island is considered to be one of the top diving destinations. Bunaken island received some publicity when the marine biologist Dr. Mark Erdmann found a living Coelacanth here, a specie of fish some 60 million years old and have never been seen before. The waters around Bunaken island are home to dolphins, whales, turtles, sharks, rays, sea snakes, sea cows, barracudas, tunas and the list goes on. Water temperatures in Bunaken island vary between 27-30 degrees Celsius all year around with a visibility generally between 20 40 meters. 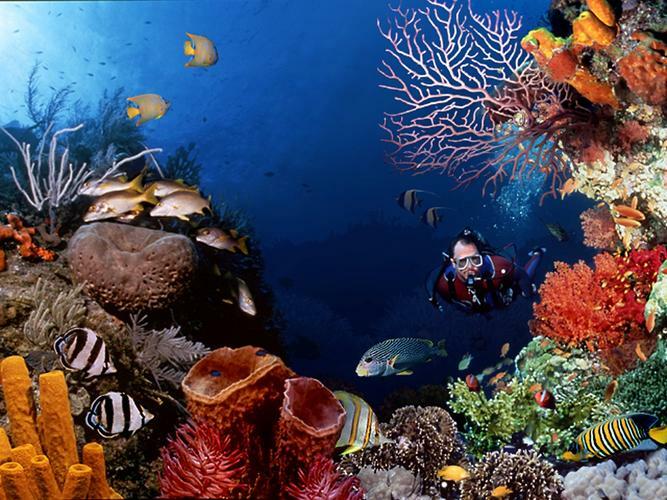 Bunaken lies in the very epicentre of the world's marine biodiversity in the Indo-Pacific Ocean. It offers more than 100 different dive sites, all rich with tropical marine life, with diving all year round. The clear waters of the Bunaken National Marine Park has been voted the global winner of British Airways Tourism for Tomorrow Award in 2003. The amazing walls of the park teams with thousands of different fish species, with huge sponges and beautiful hard corals, and countless number of fascinating critters. There is something for every diver in Bunaken region. Whether you prefer to admire the steep coral walls of Bunaken National Marine Park, explore the nearby reefs in Bangka area, or dive in the enchanting world of nature's little wonders in Lembeh Strait. Between the diving you can visit the area's other attractions. These include the bustling city of Manado, the lush vegetable gardens of the Minahasa highlands and the tropical jungles in Tangkoko Nature Reserve. Seasons: The diving is possible all year round. From Jan to March is the raining season peak. Best diving conditions are from March to December.